Quite some time ago I made Chocolate Heartache Cupcakes which used eggplant as a base, and were flour and butter free. They were so incredibly rich and moist and dense that the thought of applying the whole eggplant-as-a-baked-goods-base concept more broadly has been playing on my mind ever since. It was inevetable that my thoughts would turn to inventing a brownie that was (gasp!) healthy. I mean, who wouldn't want to be able to eat brownies, relatively guilt-free?? I carefully crafted the recipe over several days' driving to and from work (50 minutes each way. Why yes, I DO devote a lot of time to thinking about food, why do you ask?) and was finally ready to test it on the guinea pigs at work execute the magnificience that is these brownies. Inevitably I made some changes on the fly to improve the texture, but that was always going to happen. 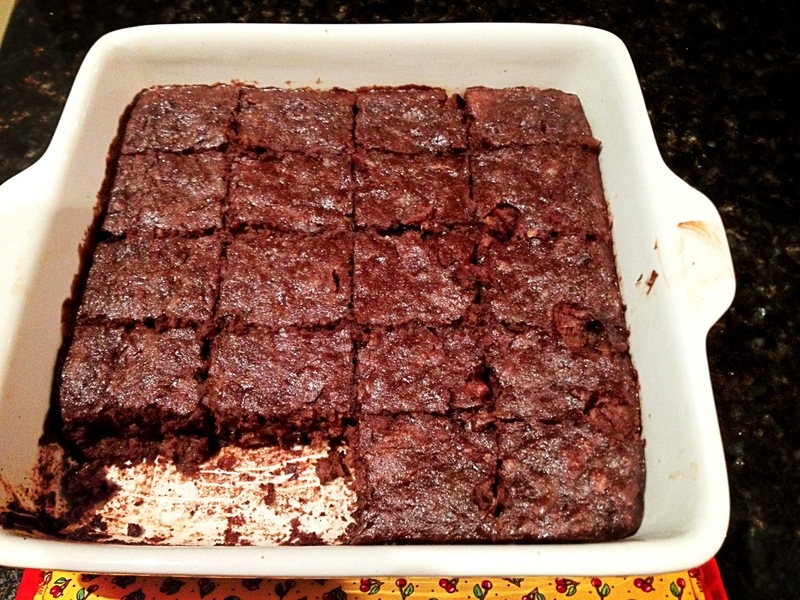 And lo and behold, these healthy chocolate brownies were born. Relatively healthy, anyhow! Prick eggplant all over with a fork and place in a covered dish in the microwave with a little water in the bottom. Steam for 4 minutes. Flip over, and steam for a further four minutes. Allow to cool enough to handle, then chop the top and peel skin off. Mash or blend until relatively smooth and set aside. Grate zucchini. Squeeze as much excess moisture out as possible. Add to eggplant mix. Mash banana. Add to eggplant mix. Melt chocolate. Add to eggplant mix. Mix in honey, lightly beaten eggs, cocoa powder, almonds and baking powder until you have a consistent mixture. Transfer mixture into a greased baking dish or tin and bake for about 50mins at 180oC until set. Note that you will likely find it quite difficult not to eat several pieces at once. If I were you I'd do what I did and bring it into work! Yep they're really yummy. One of the guys from work spotted a little bit of green from the zucchini and was skeptical, but he glared at me only momentarily before shoving the rest of it in his mouth and reaching for a second one! They're a little bit on the fluffy/crumbly side but they hold together better after having been refrigerated. I think there was the very vaguest hint of "vegetableness" about it, but it would be hard to pinpoint as being eggplant. I think I tasted the zucchini more, but the almond meal and honey certainly overwhelmed any eggplant taste. Have you ever had battered eggplant chips? To me they don't taste at all like the eggplant you would find in ratatoullie (spelling??) - just a silky, rich nothingness. It's hard to explain. Anyway, I think that's all it does for this recipe - silky bulk with very little flavour. I suspect a lot of the flavour comes from the skin, actually. They're not too far off being the real deal. They're a little structurally unstable, so I probably wouldn't wrap one up and put it in the kids' lunchbox, but for a dessert or a sweet nibble at home they'd do just fine. These are so creative! Eggplant and zucchini?? This such a cool recipe! I am amazed, I have never been brave enough to try vegetable based cakes and such, they look incredibly moist!